So, something tangential is only a little bit connected to what you're already talking about. 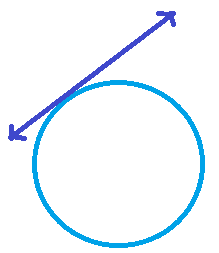 See how the line touches the circle, but then zooms off and away? Tangential things are like that; they are only kind of related. Talk about something being tangential to something else: "Her worries about a possible scar are tangential to the discussion of whether she should have the surgery." You can have tangential information, tangential comments, tangential concerns, tangential arguments, tangential factors, tangential involvement, tangential elements or parts, tangential connections, and so on. And when you're "off on a tangent," you've completely left the relevant topic and wandered off into talking about who knows what. I would hate to be in the public eye, especially in politics, because people who have had even the most tangential interaction with you can come out and say bizarre stuff about you that hurts your reputation. I can see how some writing teachers would ask their students to delete from their essays anything tangential to the main point, in the name of clarity and concision, but I sometimes find those digressions really funny and interesting; sometimes they even work as neat transitions between ideas. So I say, yes, go off on a tangent in your writing and see if it takes you somewhere awesome! Look away from the screen to explain the definition in your own words. You’ll know you understand what "tangential” means when you can explain it without saying “barely touching" or “slightly connected." Think of something important to you that used to seem much less important, and fill in the blanks: "When I was _____, (topic) to me was all about (a certain part), but now that's just tangential since I care more about _____." Example: "When I was younger, house-shopping to me was all about square footage, but now that's just tangential since I care more about character and trim." 2. Nobody's said it, but we're all _____ her for bringing up truly tangential points in each meeting.